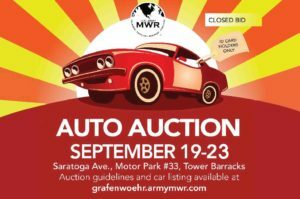 Auto Auction Viewing Dates: Sept. 19 – 23, 11 a.m. – 5 p.m. Lot is open for exterior vehicle inspection. Inspection Date: Sept. 21, 11 a.m. – 1 p.m. Mechanic with keys will be on site. Bid sheets: Available at Tower Barracks Auto Skills Center and Bldg. 539, Rm. 130 (next to VAT Office). Bid sheet must include the Vehicle Number and description. Minimum bid amount is listed on each vehicle’s info sheet. Winning bidders will be notified by September 30, 2016. Auction open only to valid U.S. Forces ID card holders, who have a valid USAREUR Certificate of License (driver’s license) for operating privately owned vehicles, and are stationed within Army in Europe. AE Regulation 190-1 limits for registered privately owned vehicles are eligible for purchasing whole vehicles from Family and MWR Automotive Skills programs. Questions? Call DSN 526-9065, CIV 09641-70-526-9065, stop by Bldg. 539, Rm. 130 on Tower Barracks or email bavaria.imcom-fmwrc.list.naf-pbo@mail.mil. Prospective customers may inspect the interior and exterior of whole vehicles that are for sale. Automotive Skills Program employees may start the engine and demonstrate functionality of vehicles that are for sale. Due to liability concerns, prospective customers may not “test drive” vehicles that are for sale. Prospective customers may review any available vehicle documents to determine the service history and last inspection date. All vehicles are sold on an as-is-basis. There will be no guarantees on any vehicle sold. In cases of multiple bids on a specific vehicle from the same customer, the customer’s highest bid will be used for the specific vehicle that is for sale. Individuals awarded purchase of any vehicle will have three working days from notice of award to pay in-full for the vehicle. All sales are final. Customers who are successful in the bidding process must use USAREUR registration procedures to register their purchased vehicle in temporary, operational or non-operational status with the USAREUR Registry within five working days after completing the bill of sale. The vehicle will remain at the Automotive Skills Center and will not be released to the customer until proof of registration is provided. If the customer does not register the vehicle within the allowed time, the customer will forfeit the vehicle and the Auto Skills program manager will process a reimbursement of the customer’s payment, minus 10% or $100 (whichever is less) to cover administrative costs. After the vehicle is registered, it is the owner’s responsibility to remove the vehicle from the Automotive Skills facility within five working days, or make arrangements for storing a vehicle that is registered as non-operational. If the owner does not remove their operational vehicle, the vehicle will be considered abandoned. Newly established vehicle owners are responsible for costs incurred from towing and storage fees for vehicles that remain at the Automotive Skills facility beyond the maximum of five working days.